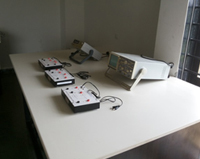 Elements of electrical engineering lab is well equipped with all the experiment set up such as Ohm’s Law verification kit, Kirchhoff’s current law (KCL) and Kirchhoff’s voltage Law (KVL) verification kit are present. The lab is equipped with instruments like megger, all type of resistive inductive and capacitive load are present for performing R-L-C ckt. It also include all types wattmeter, frequency meter, power factor meter, clip-on meter, D.C supply board, etc. 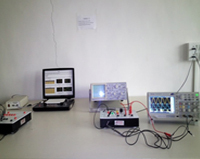 The lab is equipped with testing of fuse, Current transformer, Overvoltage relay, overcurrent relay, under voltage relay. To study the basic concept of electrical protection. Lab is equipped with 13 computers(DELL 3.6 GHz 4 GB RAM 500 GB HDD, OS: Windows 8, Processor: Intel core i3-4160 ) and 8 computers(HP Compaq Elite 8300SFF, Processor: Intel core i7-3770, CPU:3.4 GHz, RAM:2 GB,500 GB HDD, OS: windows 7 professional ). All computers are interconnected with LAN as well as they have high speed internet connectivity. All the machines are installed with licensed software like MATLAB. Students learn basic electrical simulation circuits. Many practical’s are performed on other software like Psim, Multisim & keil which is helpful in their research work also. 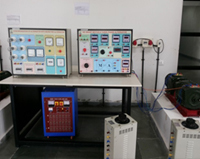 Power electronics laboratory is equipped with instrument which are useful for performing practicals. It contains different practical trainer kits to plot the V-I characteristic of Diac, Triac, UJT, MOSFET etc. It has also half bridge full control and half control trainer kit. For accurate analysis of different parameters , four channel and two channel Digital storage oscilloscopes are available. It also contains chopper fed SEDC drive panel and Controlled rectifier fed SEDC motor drive panel with desktop PC. 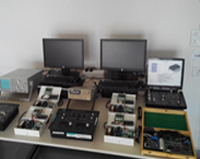 This lab includes all the instruments used for the practicals of the Electrical measurement Subject. 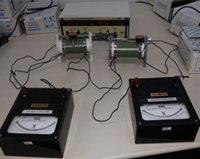 The equipments available in this lab are Different bridges, power supplies, galvanometer etc. All the practicals available into the syllabus can be performed in this lab. 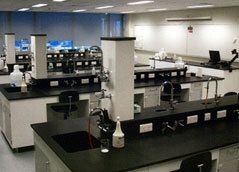 Variety of practicals can be performed by using the instruments available in this lab. Equipments available are practical kits, CRO, Function Generators etc. practical kits available are necessary for the basic knowledge of the control theory subject. Microprocessor & controller lab is well equipped for students to perform different experiments. Major equipments are 8051 microcontroller kits, 8-bit Parallel ADC/DAC Cards, I2C Card with RTC and EEPROM, SPI based IO Expander Card, Stepper Motor Driver Card with Stepper motor, Si-lab advanced 8051 kits, computers, CRO etc. 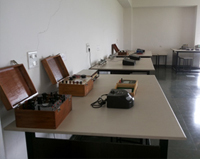 Analog electronics lab is well equipped with equipments and trainer kits for students to perform different equipments. 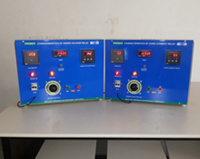 Major equipments are Dual Output power supply, CRO, Function generator, 555 Timer Kit, Bread boards, Op-Amp Characteristic trainer, Op-Amp Application Trainer Kit, Digital Lab Trainer Board etc.